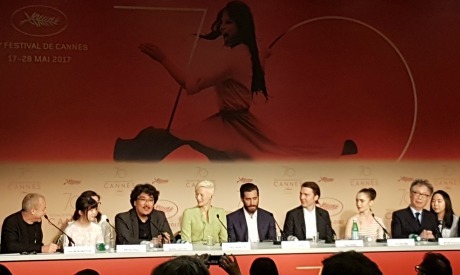 The rough reception of Netflix’s South Korean-American film Okja was met by a calm and defiant response from the filmmakers, who asserted their satisfaction with the Cannes experience. Controversy arose after the adventure film was booed in the 8.30pm press screening, especially after the Netflix logo appeared in the opening credits. The screening heated up after technical problems during the first few minutes of the film occurred. Several minutes after the start, it was obvious that the track was being played at a wrong ratio. Without any announcement or explanation, the film restarted from the beginning 10 minutes later. In the second attempt. when the logo of Netflix was shown, heckling and hissing continued. On social media, journalists and critics posted videos of the booing and the heckling that came in the beginning of the film. On Friday, throughout the Croisette and the Palais des Festival (the headquarters of the Cannes festival), filmgoers rumoured whether the incident was an act of sabotage. "This incident was entirely the responsibility of the festival's technical service, which offers its apologies to the director and his team, to the producers and the audience,” the Cannes festival said in a statement Friday. Okja, which stars Tilda Swinton and Jake Gyllenhaal, has caused heated debates after Netflix producers refused to screen the film in French cinemas after the festival. A similar incident took place Thursday when the Amazon logo was shown in the beginning credits of Todd Haynes’s Wonderstruck and was met by booing. Days before, festival jury chair Pedro Almodovar asserted that he agrees that films selected for the festival should be screened to the public afterwards. He added Wednesday that he didn’t think a film that will not be shown in theatres should win the prestigious Palme d’Or. In the 70th edition of the festival, debate intensified on the rise of mega entertainment companies and their contribution to the film industry. Despite opposition from French media, Okja, which is directed by Bong Joon-Ho, was positively received by critics who admired its visuals and political approach to following a young girl and her journey to adulthood. In a packed press conference hours after the heckling incident, the film crew were light-hearted about the criticism. When asked about the technical erro, Bong commented, laughing: "What happened this morning, I'm quite happy with it because it forces you people to watch the opening sequence twice." "There is a lot of information and story elements there. So very educational." Actress Tilda Swinton said: "It's an enormous and really interesting conversation that's beginning. But I think, as in many matters, there's room for everybody." The former Cannes juror added: "Let's be honest, there are thousands of films that are screened in the Cannes Film Festival that people don't see in the cinema. The most beautiful, the most esoteric films that people never see in the cinema." Actor Jake Gyllenhaal also commented, “Debate is essential always. It's a useful thing to have this discussion about how art is perceived and distributed."